Last weekend the Santa Cruz Symphony celebrated the animal kingdom and the arts in a Family Concert designed to entertain and educate an audience of all ages. Presented at the Civic Auditorium, Carnival of the Animals featured the orchestra in collaboration with four other significant local performing arts organizations. The annual Family Concert encourages children and young adults throughout and beyond the county to connect with members of the arts community and become familiar with cultural opportunities offered year-round. 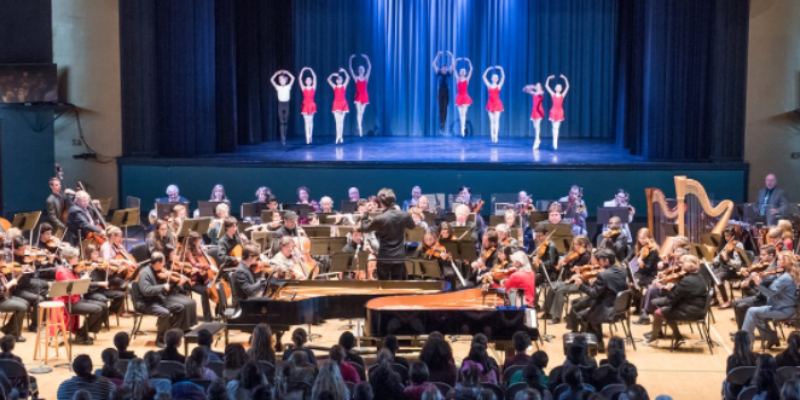 This year, the orchestra teamed up with the Santa Cruz County Youth Symphony, Santa Cruz Ballet Theatre, Kuumbwa Jazz Honor Band, and Santa Cruz Shakespeare. The partnership of talented students sharing the spotlight with advanced professionals made for a smooth and joyful synthesis of live music, dance, and poetry. Conducted by the Symphony’s Artistic Director Daniel Stewart, the orchestra opened the wildlife-themed program with buoyant sounds of the cavalry in Gioachino Rossini’s William Tell Overture: Finale, performed alongside dancers-in-training from the Santa Cruz Ballet Theatre. Next came Charles-Camille Saint-Saëns’ zoological fantasy, Le Carnaval des Animaux (Carnival of the Animals), featuring high-level members of the youth symphony and highlighting Co-Principal piano soloists Louise Costigan-Kerns and Jason Sherbundy. To characterize the instrumental impressions of animals on parade, Santa Cruz Shakespeare’s Artistic Director, Mike Ryan, narrated witty verses written for the score in 1949 by poet Ogden Nash. Together, the orchestra’s colorful performances and Ryan’s theatrical expertise conjured up the sounds and images of “feathers, fur, and fins” in lively, playful ways. Nature and music continued with the Kuumbwa Jazz Honor Band performing the classics Lullaby of Birdland by George Shearing and The Chicken by James Brown. Their zesty ensemble and solo performances, led by Director Terrel Eaton, were further proof of the value in sharing all forms of music with young adults. As a vibrant conclusion to the program, Stravinsky’s Firebird Suite: Finale was magically blended with choreography by SCBT’s award-winning Artistic Directors Robert Kelley and Diane Cypher. At the end of Carnival of the Animals, younger members of the audience were invited to become more familiar with the orchestra by meeting musicians and trying out various instruments at the “Orchestra Petting Zoo”. Through these productions, the Symphony inspires crowds of all ages to experience the arts by introducing the components of live performance and engaging the public with local performers. As well as partnering with special guest organizations for the Family Concert, the Symphony also offers four free youth concerts each year. The music marches on with more 2017 season concerts scheduled through early June. On February 18 and 19, the Symphony will be presenting renowned pianist, Yuja Wang, in an all-piano concerto program of Prokofiev and Brahms. On March 25 and 26, the recent Klein String Competition winner, cellist Oliver Herbert, will perform Pärt, Haydn, and Schubert, arr. Mahler. And on March 18, the Santa Cruz Symphony League will be hosting their 50th Anniversary Gala: Copacabana , at the Inn at Pasatiempo.